American taxpayers are often very generous, giving money to their church or favorite charity. 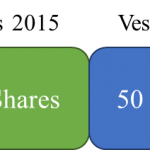 One of the most tax-efficient ways to give to your charity is to directly give stocks or mutual funds that have increased in value. This strategy tends to work especially well for employees who have received company stock over the years. Let’s take a look at how the taxpayer and charity benefits, and the IRS gets nothing. Please note, the stock must be held outside a retirement account to qualify for this particular strategy. Also, if a taxpayer doesn’t itemize their deductions, they will lost some of the benefit of this strategy. The first thing to recognize is giving money to a qualified charity results in a tax deduction on Schedule A of a tax return. A tax deduction is always nice. Assuming a taxpayer is in the 25% tax bracket and donates $20,000 in cash, they will reduce their tax bill by $5,000. We are going to assume a 25% tax bracket throughout our examples. Without knowing better, the taxpayer sells the stock to get the money to give to the charity. Unfortunately, he has to include the $10,000 in capital gain as income on his tax return and would owe $1,500 in taxes1. After paying the IRS the $1,500 in taxes, he now only has $18,500 to give and only receives a tax deduction for the amount he gives. If the taxpayer had instead consulted his knowledgeable tax advisor, he would have been told to do something completely different. This time, he worked to give his stock directly to the charity and let the charity sell it instead. The taxpayer would receive a deduction on the full $20,000 that the stock was worth. The big advantage, though, is that no one would pay the $1,500 tax on the capital gain. The reason is the qualifying charity is a tax-exempt entity. When the taxpayer sold the stock and gifted the cash, they owed $1,500 in taxes and received a $18,500 tax deduction worth $4,625 in tax savings. When the taxpayer gave the stock directly to the charity, neither they or the charity owe any taxes. 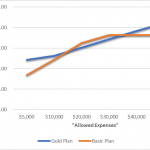 The taxpayer also receives the full $20,000 tax deduction worth $5,000 in tax savings. As you can see, gifting the stock directly to the charity is a win-win for both the taxpayer and the charity. The only “loser” in this outcome is the IRS. Cates Tax Advisory always strives to help you keep your hard-earned money in your pocket and out of Uncle Sam’s coffers. One of the best things most taxpayers can do is keep their AGI (adjusted gross income) as low as possible. 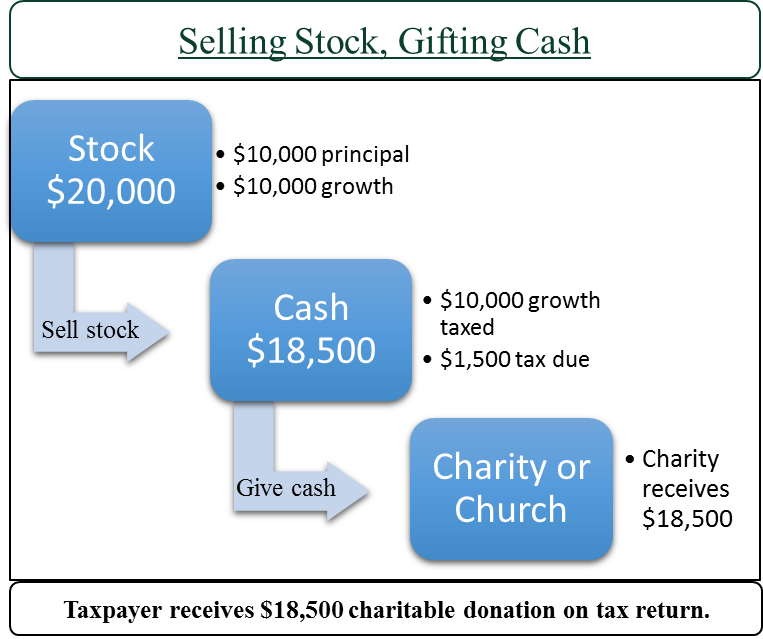 Unfortunately, by selling the stock first and then gifting the cash proceeds, our hypothetical taxpayer has actually increased his AGI by $10,000 (the gain on the stock). The tax deduction he receives for the donation doesn’t come onto his tax return until after his AGI has been calculated. So what could this do to our taxpayer? Let’s quickly go through three brief examples. Our taxpayer has children who qualify for the child tax credit. His income also happens to be in the phase-out for the tax credit. The additional $10,000 on his AGI will cost him $500 in lost tax credits. Our taxpayer is a retired couple living modestly off their Social Security, interest and dividends on their investments, and Roth IRA withdrawals. Their AGI is just below the threshold where their Social Security is taxed. The $10,000 capital gain from selling the stock could push their AGI up and cause $5,000 in Social Security benefits to be taxed. Since in this scenario the couple would probably be in the 15% bracket, the tax on the $5,000 in Social Security benefits would be $750. Taxpayer has extensive medical bills and is able to deduct $5,000 in medical expenses. The $10,000 income from the sale of the stock increases his AGI and reduces the amount of medical expenses he can deduct by $1,000. The lost $1,000 deduction costs him $250 in taxes. These are just three examples to provide an idea of how an increase in AGI can cause havoc with other things on a taxpayer’s tax return. The ability to gift appreciated stock or mutual funds to your favorite charity is a very valuable way to save taxes and maximize your gift. Next time we are going to talk about why this often benefits people who receive stock from their employer, plus some very specific things that need to be done to correctly donate stock. Email me at cary@catesfp.com or call 940.368.0909 if you have any questions about how tax planning and advice could save you money. 1Some details have been left out to make the blog piece more readable, but the outcomes are what the majority of taxpayers would experience. 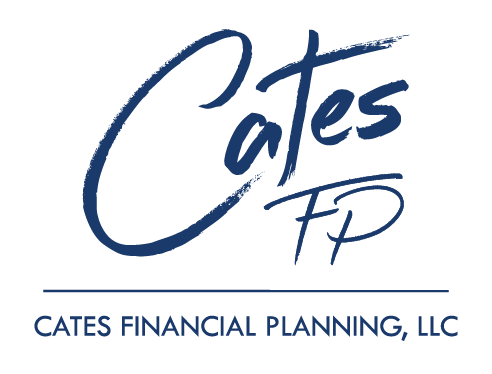 Cates Financial Planning, LLC (“Cates FP”) is a registered investment adviser offering advisory services in the State of Texas and in other jurisdictions where exempted. Registration does not imply a certain level of skill or training. The presence of this website on the Internet shall not be directly or indirectly interpreted as a solicitation of investment advisory services to persons of another jurisdiction unless otherwise permitted by statute. Follow-up or individualized responses to consumers in a particular state by Cates FP in the rendering of personalized investment advice for compensation shall not be made without our first complying with jurisdiction requirements or pursuant an applicable state exemption. All written content on this site is for information purposes only. Opinions expressed herein are solely those of Cates FP, unless otherwise specifically cited. Material presented is believed to be from reliable sources and no representations are made by our firm as to another parties’ informational accuracy or completeness. All information or ideas provided should be discussed in detail with an advisor, accountant or legal counsel prior to implementation.